This beautiful, disc-shaped, black, gray and gold angel has brilliant yellow bars and blue highlights as a juvenile, fading to beautiful gray as adults. 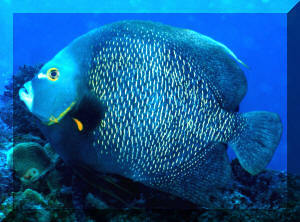 The French angel, Pomacanthus paru is a readily available, inexpensive and adaptable large marine. They are long lived, disease resistant, and with care become hand-tame. A testament to the French's hardiness is their widespread use in aquarium 'service' accounts. Providing you allow your French angel plenty of space, acceptable water quality and foods with enough green and sponge material, this is a specimen that will stick with you for years. 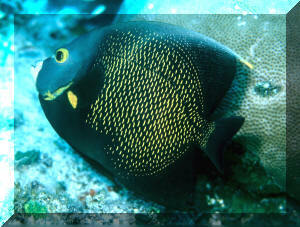 Pomacanthus paru (Bloch 1787), the French Angelfish (1). Another standard in the aquarium trade. Beautiful and hardy, and large (to fifteen inches in length and a foot tall). Tropical west Atlantic from the Bahamas to Brazil. Pictured: a three inch juvenile in captivity, foot long adult in Belize, and sixteen inch individual off Boynton Beach, Florida. French angels hail from both sides of the Atlantic. To the west mainly between the Bahamas, Florida to Southeastern Brazil. Occasionally, currents carry specimens farther up the eastern seaboard. The species has been hormone-induced-spawned in captivity and the young raised to selling size. 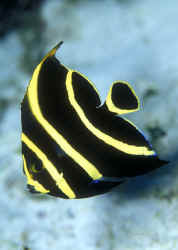 The French angel, described by Bloch in 1787, is one of 13 species in the genus Pomacanthus in the saltwater angelfish Family Pomacanthidae. Hobbyists in the know are familiar with other members of this genus, such as the sympatric Gray Angelfish Pomacanthus arcuatus, the Koran P. semicirculatus, Majestic P. navarchus, Blue-Ring P. annularis, Cortez P. zonipectus, and super beautiful and expensive Red Sea P. asfur and P. maculosus. 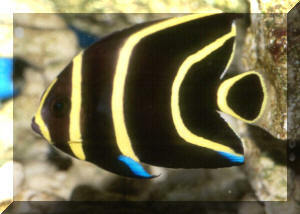 The marine angelfish family works overtime in providing saltwater aquarists hardy show piece specimens. Gray and French sub-adult Angels for comparison. Ask people who have had both; French angels cost a few dollars more than grays, but are worth it in terms of their better color and more interesting behavior. Juveniles of three to four inch total length are best for most aquarists. They are extremely hardy at this size, adaptive behaviorally and easy to train on non-natural foods. Tank raised individuals have been offered from time to time of smaller, but acceptable lengths, and substantial savings. Try one of these if you can find them. Larger to largest individuals, up to sixteen inches, should only be tried in huge capacity systems, a few to several hundred gallons. Over six inches or so, specimens have a greater propensity to go on food strikes, and develop other 'anomalous' poor adaptive activities. If you want a big French, either grow one up yourself or purchase a trade-in; large wild-caught angels frequently fair poorly. Most specimens offered have been collected by non-damaging means and adapt well to captivity. The most disqualifying criteria are labored, rapid breathing; indicative of probable handling damage and possible heavy gill-parasite load. If the individual eats readily and seems interested in it's environment, I would easily overlook a torn fin. Chemically, French angels are extremely tolerant as marine species go. They have been used to institute nutrient cycling in place of the "standard" damsels. Physically, also, they do well under a broad range of conditions. Temperatures in the low to upper seventy degrees Fahrenheit are within their natural range. French's are euryhaline; that is, not sensitive to a wide span of salinity. The lower range of specific gravities, 1.018-1.021 is suggested. This saves on salt mix, allows for greater gaseous diffusion, and disfavors external parasites. Habitat-wise, the French's offered in fish stores are found associated with rocky, broken bottoms and over grassy flats from Florida to Brazil, in the Bahamas to the Gulf of Mexico. Provide numerous rock, coral et alia nooks and crannies/comfort spaces for this angel and it's tankmates. French angels are best kept one to a tank. If they are to be mixed with angels of other genera, it is best to introduce them to as large a system as possible (fifty gallons plus) at the same time. Often, a new slightly larger individual may be added in an established angel system. Moving some of the habitat around and feeding at the time, and keeping a sharp eye are requisite. Pay careful attention if mixing angels within this genus, as one will grow more quickly and eventually do harm to it's fellows in all but the largest of systems. Small French's display a fluttery motion, as if wagging their bodies when they swim. The sibling gray angel species do not "wag". Juvenile French's are renowned facultative cleaners. They may be used in place of Labroides wrasses, cleaner gobies or shrimp as biological controls of parasites. In the wild they set up formal cleaning stations. Beyond three to four inches in length their cleaning activity drops off rapidly. Moe (1976) describes natural and captive spawning for those with gigantic systems and big dreams. A very critical and frequently the weak area in keeping marine angelfishes. French juveniles accept live, frozen and dry-prepared foods readily. Adults can be kept in good health by feeding cut squid, crustaceans, nutritious prepared frozen foods and some substantial amounts of "green" materials. Caulerpa and Ulva algae and table-salad matter is acceptable. For optimal health and color, either a prepared sponge-containing food or live-sponge-rock must be provided. Stomach contents analysis of wild French angels reveals the importance of sponge matter to these and other Caribbean angels. Pomacanthus paru is typically disease-resistant and long-lived, providing you start with a clean specimen and keep it under proper conditions. One oft-cited problem is a type of blindness seems to be a result of dietary deficiency. Using a substantial amount of plant material, frozen, fresh, flake with vitamin supplements precludes this problem. Check your prepared foods label for "stabilized" vitamin C, or provide same to the water or food on a regular basis. These fish are not easily susceptible to disease; they should be about the last one's to show evidence of the same. The common parasitic marine diseases can be quickly cured up with copper medications and/or manipulation of specific gravity. So here is another Caribbean angel well-suited as an aquarium specimen. A good angel for the beginner marine keeper to the professionals looking for a restaurant, doctor's office show piece that is hardy and imprints on humans. DeGiorgis, Joseph A. 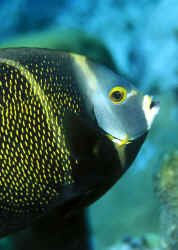 The French Angelfish: Pomacanthus paru. FAMA 3/87. McKenna, Scott 1990. Keeping the Flamboyant French Angel. TFH 1/90. Stratton, Richard F. 1992. 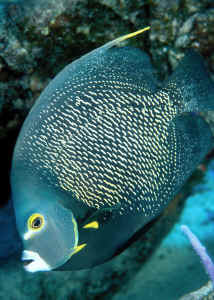 The Gray Angelfish, Pomacanthus arcuatus. TFH 3/92. Tuskes, Paul M. 1980. 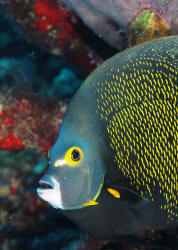 Observations on Tropical Atlantic Angelfish on the Reef and in Captivity. Freshwater and Marine Aquarium 5/80.